Context is the ground we build on. 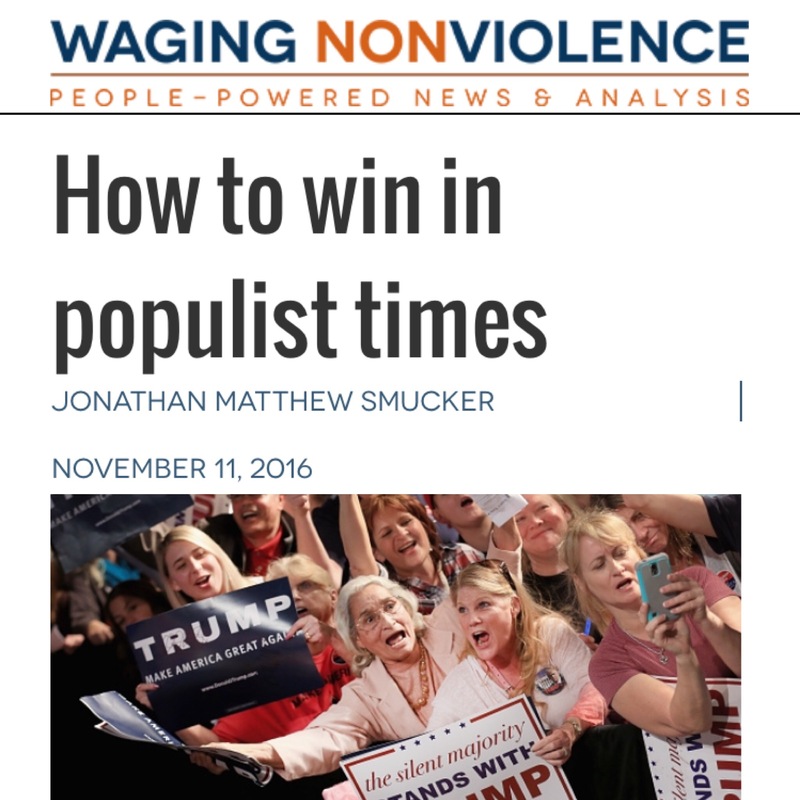 The second primary role of an antiwar core that we will discuss is to formulate winning strategies and articulate them in a way that will inspire broad action to end the war. Taking action with a faith in the possibility that we may somehow end the war is very different from taking action with a strategy about how to do it. The former is a shot in the dark. The latter is a hard target, but one we’re likely to get closer to the more we practice. Faith in the possibility of affecting change is an important starting point – a prerequisite for social change work. Given the profound level of political disempowerment in our society, such faith should not be undervalued. But good strategy must be informed by much more than faith. The more information we have, the more likely that our strategy will be on target. What kind of information are we looking for? Well, who are the decision-makers? Who or what influences them? What are the decision-making processes? What alliances and tensions exist within “the system”? What are the possible legislative and legal points of intervention? Who are our allies? Who are our potential allies? What related issues are other progressive groups working on? What are the big concerns in our communities, and how are they articulated? How do people get their news and information? What are the cultural narratives that hold meaning to the people around us? What are people’s attitudes toward “activism” or “activists?” What is the history of social change, and how is that history perceived? Answering these (and many more) questions will give us a lay of the land that will help to inform our strategies. The more detailed our information the better, as outcomes are determined by the complex interplay of details. The success or failure of a social struggle can ultimately come down to the smallest details. It is therefore to our advantage to rid ourselves of any tendency to oversimplify, over-generalize, monolithize or mystify our circumstances, and to shift to a mentality that appreciates complexity and studies detail. This requires learning to see the world as it is, rather than as we may want it to be. Failing to attain an intimate knowledge of our particular organizing contexts, we tend to rely on our assumptions, which can be false or at least not fully true in important ways. Sometimes change agents incorrectly assume that we are the only ones who care about an issue; we see “the system” (or even society) as monolithic, preventing us from leveraging important fissures and vulnerabilities, and from finding potentially key allies and defectors. Strategy is not built upon assumptions, worldviews or projections. It is built upon intimate knowledge of context. Without contextual knowledge, change agents will lack a strategy. And without a strategy we go into battle armed with principles, maxims and truths. As the saying goes, you don’t go into a gunfight armed with truth. You go with a gun. Our struggle is not a gunfight, but it is in part a struggle for power. While truth and principles are important, we can’t end the war armed only with these; we need strategy. To be fair, change agents usually go into battle armed with more than truth. We usually go with tactics. Some change agents have developed and honed a large arsenal of tactics. But to be effective we need an overarching strategy to guide and shape our tactical choices. Indeed, there is a large amount of confusion about the difference between strategy and tactics. A strategy is an overall plan about how to obtain a goal. Tactics are the specific actions and methods used to carry out that plan. In their campaign strategy workshops for social justice change agents, The Ruckus Society presents a framework that progresses from issue to goal to strategy to tactic. The first step is to define the issue. The goal is what the change agents want to accomplish. Their strategy is their overall plan for how they intend to reach their goal. Finally, their tactics are the specific activities utilized to carry out their plan. For example, if a group’s issue is a waste incinerator in their neighborhood, their goal may be to close it down. Their strategy may be to organize the neighborhood around the issue and pressure the local political system to close the incinerator. Their tactics may include holding public meetings, circulating a petition, going door to door, and meeting with local politicians. Each tactic should be evaluated for how, specifically, it will further a strategy that moves the group toward achieving its goal. Again, the more specific the group’s contextual knowledge, the better. Which people in office actually have the power to deliver the goods? Who or what influences them? And so on. When a group is working toward a very large goal, like ending a war-or even changing the very nature of US foreign policy-they have to break it down into a series of steps for how to get there. They need to set interim goals that are both concrete and attainable. The issue / goal / strategy / tactic framework will be most helpful for local antiwar groups when applied to specific interim goals that are winnable within a measurable amount of time. The antiwar movement’s focal issue is (obviously) the war. Our goal is to end it. Broadly, our strategy could be to mount strong enough pressure to force the political establishment to capitulate to our demands, and more specifically to pressure Congress to de-fund the war. Interim goals may include winning over specific legislators to our position. These interim goals of the larger movement could serve as the primary focus for specific local antiwar groups, according to their specific regions. To achieve their goals, local antiwar groups’ tactics may include holding public meetings, circulating petitions, door-to-door organizing, lobbying representatives, holding educational events, public vigils and mass demonstrations, writing letters to the editor, and grabbing headlines through creative direct actions such as following their representatives around with super-sized checks from Halliburton. Multiple and complex factors should be considered when choosing or inventing a tactic. First, a tactic should be framed intelligently within a coherent strategy that is projected to move the group closer to achieving an attainable goal. Tactics should be informed by what the group wants, who can give it to them, who can help them (natural allies), who is their audience, what is their message, and much more. The tactic star (below) describes some key factors to consider when determining a tactic. Tactics carried out without regard for strategy or context may be as effective as shots in the dark. This is not to say that just because a tactic lacks a conscious strategy it therefore has absolutely no strategic value. After all, sometimes shots in the dark do hit targets. Also, in most situations at least some of these factors are considered to some extent, even if informally. But a more formal examination of these factors when considering tactics will increase the likelihood of success. In lieu of a strategy, change agents will often search for the “perfect tactic”, or the “most radical” tactic. Sometimes we experience or hear about a tactic used one place, and then attempt to replicate it somewhere else without appreciation for the changed local context. While it is valuable to continually explore new tactics and expand our toolbox, still context is essential. We have to accurately gauge our local contexts. When we speak of winning strategies we are not talking about easy solutions or the “perfect tactic.” Sometimes the search for the perfect or “most radical” tactic causes activists to believe in tactics rather than believing in people. What progressive person hasn’t heard (or thought) some version of the following? “If we could get enough people to engage in Gandhian nonviolence…” or “If we could get enough people to vote for the right candidate…” or “If we could get enough people to observe a boycott…” or “If we could get enough people to take up arms…” and so on. The reality is that probably all of the above tactics have potential to be effective, if indeed we could get enough people to participate. There is no silver bullet tactic. The trick to social change is precisely getting enough people. While choosing (or inventing) the right tactic at the right time can profoundly influence participation levels, tactics are still but a small part of the “getting enough people” equation. Getting enough people is what organizing is all about. There is no magic tactic that, on its own, will instantly set wildfire to our proverbial prairie. There are moments when the right tactic can act as a spark to set the prairie ablaze, often giving the illusion that the fire was caused solely by the spark (e.g. Rosa Parks). But, to extend the metaphor, you can ignite sparks, light matches, or even use a flamethrower, but if the conditions of the prairie are not ripe, the fire will not spread. In speaking of conditions, movement strategists commonly refer to objective and subjective conditions. Objective conditions include factors such as poverty level, disparity of wealth, structure of governance, degree of control and repression. Subjective factors pertain to us, the agents of change. How many of us are there? How organized are we? To what extent are we connected to a base? Have we built bridges between different communities? Objective and subjective conditions are not entirely separable, and both are important in determining our likelihood for success in particular contexts. The fact that a large majority of Americans now oppose the Iraq War should certainly be counted by the antiwar movement as a favorable objective condition. However, other conditions are limiting what we have been able to accomplish, even having popular opinion significantly aligned with our position on withdrawal. These conditions act as obstacles to building a force strong enough to achieve our goals. Objectively (pertaining to the broad social and political context in the US) these obstacles include a government with little public account- ability, a corporate-owned media, widespread resignation, lack of political agency, a spectator society, fear, consumerism, lack of personal stakes, deep race and class divisions, ignorance, and negative attitudes in the culture about activism, social movements, collective action, etc. Subjectively (pertaining to the current antiwar movement) obstacles include limited resources, a shortage of skilled organizers, lack of an overarching strategy, structural limitations of many progressive organizations, sectarianism, purism and self-isolation. Popular bitterness about the war will certainly aid antiwar organizing. We should not underestimate its significance. But we should equally not underestimate the importance of overcoming the above-mentioned obstacles. These constraining conditions must inform the antiwar movement’s strategies. We have to be both realistic about the present limitations and visionary about how to push those limits. The antiwar core is in a bit of a Catch-22. To attract more people we have to convince them that we have a winning plan. But our winning plan is reliant on their participation. So, while our primary strategy should be to build a bigger movement with enough power to achieve our goals, to do this we have to get much more specific in the strategies we articulate to the public. Progressives often talk about how bad things are. We sometimes talk about what a better world might look like. But what we need is a compelling story about how to get from where we are to where we want to be. Without this we will continue to mobilize relatively few people. The previous essay argued that the antiwar movement must interpret events not just for our own understanding, but also to tell a persuasive story to the broader society (especially to the constituencies that we aim to organize). It is the same with broadly articulating a strategy. If our public presentation doesn’t include strategy, then our story has only an oppressive beginning and a wishful fairytale ending – lacking a convincing plot for how to move from the former to the latter. People may suspend their disbelief when listening to stories for entertainment, but not when they are being asked to take action and invest themselves. We have to articulate a viable plan. We have to map the political machinery and explain specifically how we can leverage power to end the war. And we have to examine the various mechanisms and stories used to inoculate so much of society against the idea of participating in collective change efforts. The antiwar core’s role of articulating a viable strategy for broad-based action to end the war is essentially instructive. To pull off an instructive role, one has to be seen as credible and trustworthy in the eyes of those receiving instruction. The word instructive is not to depict an active movement relating to a passive society – quite the opposite. This is about the recurring historical phenomenon in which everyday people look to a core of change agents for direction. Again, core is not meant to exclude, but to clarify roles so that the core-those who can give a lot of time and energy-may consciously facilitate the participation of people who want to do something but do not have the time, energy or desire to be part of a core. Today’s antiwar movement has to gain some ground before whole layers of society will look to us for direction. We have to break down negative stereotypes about us. We have to reinvent ourselves as insiders. We have to create new stories and meanings in the culture about collective struggle. But we need to do more than just appear credible. Fundamentally, we have to earn confidence and trust. Being right or righteous will not cut it. We are not entitled to lead by virtue of holding the most correct political line, the most radical tactic, or the highest principles. Yes, we have to prove we will not betray guiding principles, but we also have to demonstrate an ability to make good decisions that result in some interim victories. We have to make headway. We have to project ourselves as winners. Building hope is more than telling a hopeful story; if we are to hold people’s attention, there must be signs (evidence) of hope unfolding throughout the plot. We have argued in this essay that a primary role of antiwar change agents is to formulate and articulate a strategy for mass action to end the war. We have described how effective strategies are informed by an intimate knowledge of context and a thorough study of objective and subjective conditions. We have argued that strategies should determine tactics. We have named several conditions that presently act to constrain the antiwar movement. We have argued that a pressing project of progressive change agents is to build hope, and suggested that broadcasting a believable strategy with attainable interim goals is a necessary part of this. Finally we have stated that to play an instructive role, change agents must not only become credible; they must gain people’s confidence. When we mistake widespread resignation for apathy, we sometimes take to sustaining ourselves with a story of “the righteous few.” Maybe most people don’t care, but I do. I’m taking a stand. I am a person who is willing to take risks for what I believe. This courage and character is laudable and an asset to any movement. The problem is when we become attached to marginalization, as if we’d be selling out if our ideas were ever to become popular or take hold. The story of the righteous few is self-perpetuating. Lacking a strategy, we can’t get our minds around winning. If you can’t win, the next best thing for a conscientious person is to be righteous. Putting righteousness (our intentions) before effectiveness (our impact) discourages strategic thinking. Thus we lack a strategy. Lacking a strategy, we can’t get our minds around winning… ad infinitum.